Come and Sing! All are welcome to sing in the Open Arms Choir! The COA choir is a family within our church family, and we meet to rehearse on Wednesdays from 5:45-7:00pm in the Sanctuary, and again on Sunday mornings from 9:30-10:00am. Directors, Susan and Megan, strive to keep a relaxed atmosphere during our weekly rehearsals while also working on healthy vocal technique, and moving at an efficient pace to learn our weekly anthems. 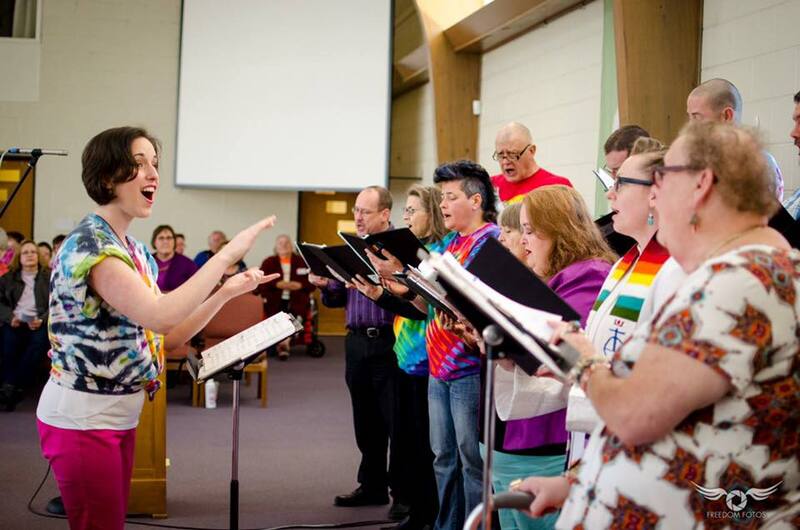 If you have ever wondered about singing with us, please feel free to sit in on a rehearsal or two to see if our choir fits into your church experience. Our members come from a wide variety of musical backgrounds, and each individual has the chance to grow as a singer and ensemble member by sharing their voice with us. We have lots of fun, and make beautiful music in a no-pressure environment. Give it a try, and find your love for singing! Mixed Company is the church’s premiere band, and we play on certain Sundays each month. We often play to raise funds for just causes because we believe that “if you want peace, work for justice.” Read more about us in Oklahoma’s City Sentinel article here. Check out our music here.